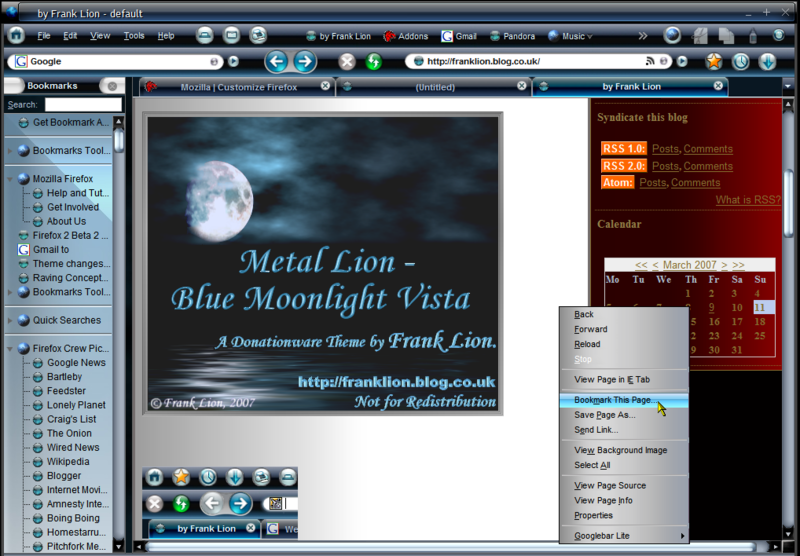 Metal Lion - Blue Moonlight Vista - a theme for all Windows versions, Linux and Mac Operating Systems using the Firefox 2.0+ Browser. This is a brand new Firefox theme of mine, which is essentially a meeting of my Metal Lion style and the new Vista style. Click picture for full size. Bit busy atm, so theme support questions from users directly to here, please : http://franklion.co.uk/ ...although, as usual, feel free to ask here if it is not that urgent. On a personal note, my sincere thanks to my usual top rate betatesters and also to everyone who worked hard with me on this one. ...finally a personal message to the design team at Microsoft from Mozilla Firefox - Hi there! Frank, beautiful job on this theme. It's real eye candy! The glass buttons are sharp, and I especially like the blue shading. The drop-down menus are extremely well done. Works without a bug with Bon Echo. Jimfitter has just about said it all---and far better than I ever could, especially where I'm not known for being brief. Thanks Jim! You've truly outdone yourself here Frank with a real delightful and beautiful work of art. That's how I see this delicious piece of eye-candy! And talk about it dressing up a desktop? Wow! I know some people don't go for dark themes. I didn't until this one, that's for sure. (I think it's because of my vision problems.) But this theme is "dark without being dark" as odd as that may sound, and I think it's because of the blue-crystal highlighting throughout that gives one that impression. Another thing that lends to the effect of it not being necessarily "dark" are the drop-down menus being in a different shade, nearly a "silver-ish colour". The crystal-blue highlighting as you scroll through your choices on the menu are a very pleasing effect as well. By and large the very best of all your themes to date with your exquisite attention to every fine detail. You've taken Firefox to a higher level with this work of art, made it something even more enjoyable to use than before Frank. Thank you for that! Keep up the fantastic work, O Master Themer! This was my first try at a 'dark theme', and I always figured that there was a way to make a dark theme look right and still retain visual functionality for fast, serious use. But... in the meantime, you'll have to make do with this lame old thing. Unlike the pics here, my tabs are showing black text on black tabs with TMP in default mode. I have disabled TMP then middle click to open bookmarks and such in tabs with white text. digs wrote: Unlike the pics here, my tabs are showing black text on black tabs with TMP in default mode. I have disabled TMP then middle click to open bookmarks and such in tabs with white text. This is part of one of your screenshots, correct? That red tab text colour there, didn't just make itself up, did it? haha...ain't from my theme...you put it there...same with the black tab text colour. Re-enable TMP and change the tab text colour options. It is no good disabling or uninstalling TMP, as the tab text colour choices that you made there will then just remain in prefs.js...forever. If that doesn't work, please ask about this on the Tab Mix Plus extension thread, as I have no control over what this extension does. 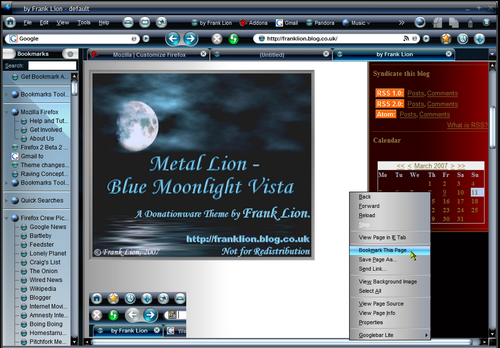 Frank Lion wrote: Metal Lion - Blue Moonlight Vista - a theme for all Windows versions, Linux and Mac Operating Systems using the Firefox 2.0+ Browser. Geez this is a very nice theme. I am just wondering though why do you charge for this, I do appreciate that you put allot of hours and time into this but I have always thought of anything mozilla was free and safe. so is there a forced donation to receive this theme? ... now I think of it, MacDonalds charge for cheeseburgers, hmm, odd. Guess that's two of us wondering. There seems to be a misconception that "Open Source Software" equates "Free" as in "Free in Speech" when in fact it equates "Free as beer." Now while beer in and of itself is "free", the by-product of the process, there is still a cost involved somewhere along the line, whether you've paid for the brewer to brew it, or if you've brewed it yourself then you've invested time, and money as well, in the purchase of the hops, the grain, and other fine products to produce the free by-product. Correct? So is the same for Open Source Software. Mozilla is only able to "give the browser away free" because others give to it, be it in time (beta reports/testing, coding, etc. ), donations, and grants, plus the business deals made by Mozilla.com with other businesses for the inclusion of Mozilla coding into their projects, and vice versa. Therefore we reap the benefits of a free browser. Comes to the same with themers. They all have jobs, lives, families, definitely bills to pay, whatever we face in our own day-to-day lives. What has surprised me here is that more themers haven't done what Frank has done long before this. That has been the big surprise to me in all of this. Maintain a fairly large pool of totally "Free as in speech" themes for people to download for their Mozilla Products so we don't have to put up with the common banality found in the large part of Mozilla themes, and then had yet a secondary pool of themes that are "Free as in beer" that people can donate to for extra special effects. Myself? I stand behind Frank and applaud his decision in what he's done and the choice he's taken. I would encourage other themers to likewise follow this path---and this coming from a person who himself can't donate for the "extras", but who can well understand the operation behind Open Source Software. Nobody "forces" anybody to download this theme. Frank has other very nice themes that are "Free as in Speech" available. His "Ice" series is spectacular! As an aside though? I always preferred the Fish Filets at MickyD's myself. Oh yeah---and the Shamrock shakes at St. Paddy's time. Yummie! But I doubt they had those in UK, eh Frank? And umm... Frank? It'd look pretty in pink. There are plenty of themes available as free- or share-ware, but Blue Moonlight Vista is a good value in that horse race. I use my browser for several hours every day and am willing to pay for something that makes the experience more pleasant. yes but guess what the browser is still free which is my point, but then I didn't realize that you do have the other themes that are free so this does make more sense to me now. and ok I have to admit I am a little jealous in not knowing how to make themes in the first place lol. While it's not actually the easiest thing in the world to do (I certainly can't do it with Firefox/TB as I've tried---though I did make a personal Mozilla Suite one, plus I'm a former K-Meleon themer), it's far from the hardest thing in the world to do either. A lot of people started out by taking the theme they liked the best out of its extension folder in the Firefox profile folder*, it resides inside a .jar file see? Now a .jar is simply a .zip. The programme 7zip will easily open it. Open it up, dig around inside, explore, read the files, and see how things are done, try making a few changes and icon substitutions... and you'd be amazed that you just might have your own theme up and ready for download. Or at the very least, like I did with the Mozilla Suite, your own personal theme to enjoy. It truly can be satisfying and a lot of fun just to see how creative you can be! Hope this perhaps gives you some ideas my friend? *Another place where people often look is inside the programme's "Chrome" folder (or so it was in the "old days") for a .jar called "Classic" as that used to contain the default Firefox theme. Not sure though if this is still the preferred place for keeping it or not but many experienced people here would be glad to help you out in a separate thread if you ask. First check the sticky threads at the top of this theme forum. Good Luck! Bonne Chance! Hi all, I've just had a few posts split off this thread, as I feel some of you are missing the point here. 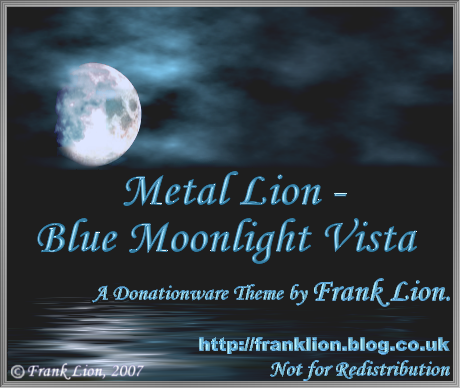 This thread is just an announcement thread for my latest Firefox theme, Metal Lion - Blue Moonlight Vista and that's all. What it is not, is a place for people to endlessly agonise whether they can afford to donate the minimum $9 or not. Some people don't have this problem and some other people just use one of the higher donation level links, whilst disabled people I know get this theme for nothing. That's how this stuff works. I have other things to do, so this theme is not for you? just move on or use another of mine or none at all, OK? Is there a chance we can see this as a Thunderbird theme, down the road? Also, how can I get this to be a g-mail skin?